LavaCore is a technically advanced fabric, constructed and engineered exclusively for water sports requiring the ultimate in thermal control and superior comfort. This unique synthetic construction closely matches the stretch and movement of a traditional lycra rash vest, while providing the insulation qualities similar to that of a neoprene wetsuit. Close to the skin, LavaCore's soft internal fleece and high 4-way stretch produces the ultimate comfort>warmth>weight ratio, a true leader amongst any fabrics within the water sports industry. Wet or dry, hot or cold, LavaCore helps control your core temperature longer, whether worn as a stand alone garment, or under your wetsuit or clothing. OUTER lycra layer is a 180 g/sqm knitted nylon wrap knit Tricot with water repellent treatment to ensure fast water run off and anti wind chill properties. INTER layer is an impermeable breathable Microporous high stretch PU film which is wind proof and breathable allowing perspiration to be drawn away in hot conditions. INNER Fleece layer is a 240g/sqm 4 way stretch polyester fleece with elastane. It has Anti Pill treatment, as well as Anti Microbial treatment to reduce odor and eliminate bacteria. 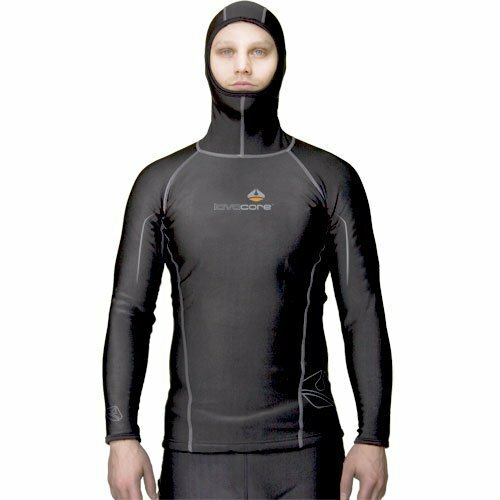 Water resistant outer layer on all lavacore suits facilitates fast water run off and is incredibly quick drying. Wind proof middle layer provides anti wind chill properties and ensures you stay warm in cold conditions. Antibacterial inner fleece minimising odour and eliminating bacteria. 4-way stretch makes Lavacore incredibly comfortable to wear. Breathable middle layer allows perspiration to be drawn away in hot conditions. If you have any questions about this product by Lavacore, contact us by completing and submitting the form below. If you are looking for a specif part number, please include it with your message.